Those in the early-1980s who loved super fast European sports cars, the Lamborghini Countach and the Ferrari 512 Berlinetta Boxer were the super sports cars they wanted to drive. However Ferrari wasn’t happy, performance-wise the Countach was giving the Boxer a run for its money. Ferrari with the Boxer still managed to beat the Countach but the margin had become very slim by the early-1980s. Ferrari felt the 1984 Ferrari 288 GTO would be the car to give Ferrari clear performance hegemony again, especially in the U.S. Market where the Boxer was not legally available for sale. With a 0-60 mph time of 4.9 seconds and a quarter mile time of 13.9 seconds the turbo V8 powered GTO was nothing short of a road rocket. The GTO’s styling was very close to Ferrari’s entry-level 308 model, which was a good thing, but the styling for most exotic sports car buyers had become a little long in the tooth by 1984. This is where the 1985 Testarossa came into the equation. It was a new design, not borrowed from any previous Ferrari. 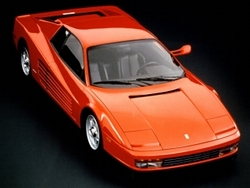 Just like other Ferrari body designs like the 308, the Testarossa’s lines were created by Pininfarina. The Testarossa was subjectively the most beautiful super sports car ever be produced. It was a very wild design with a long front hood and a super-wide rear section with massive side finned vents for engine cooling. Yet the design was also elegant. Somehow Pininfarina managed to make these crazy proportions look so good, that even today the Testarossa is considered a legendary artistic work of automotive art. The design was so beautiful, Ferrari kept it untouched for 7 model years. Even the late-model European exotic sports cars of today can’t match the Testarossa’s styling. A majority of Testarossas rolled off the assembly lined painted in bright Ferrari red, but this didn’t mean the Testarossa was just another pretty redhead. It was a car that was as fast as it looked. It went 0-60 mph in 4.9 seconds and the quarter mile in 13.2 seconds. It also remained true to Ferrari’s heritage (unlike the 288 GTO) by having a free-revving 12-cylinder engine. 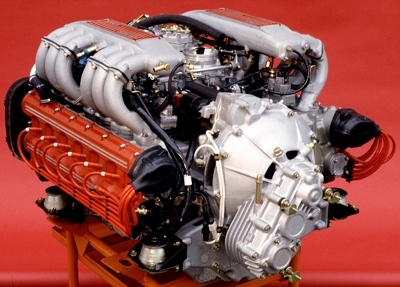 The Testarossa had a mid-engine configuration which provided plenty of space for the large Ferrari 4-valve per cylinder flat-12. This engine provided a mighty 380-390 horsepower and 361 lb-ft of torque. But the real fun was harnessing this motor via the mandatory 5-speed manual transmission with the traditional gated shifter. This combined with its wild styling and sheer power will put a smile on any car nut’s face. Not to mention it had ultra precise handling which even by today’s standards would be considered top notch. The 2-seat 1985-1991 Testarossa easily made our list of the best sports cars for this and the other mentioned reasons.